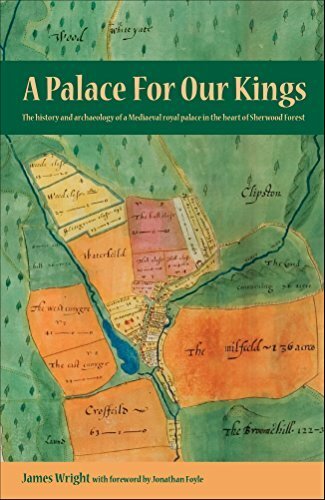 A Palace for Our Kings by James Wright is the story of the palace of Clipstone, sometimes known as “King John’s Palace”, a royal residence found in Sherwood Forest, and a favourite place of some of history’s most famous royal figures. When I first picked it up, I prepared myself for what I imagined might be a dry read – after all, wasn’t it just going to be a list of comings and goings? But Wright has put together an enjoyable, extremely readable history of a palace that held an important place in medieval history. Wright’s history of Clipstone takes the reader chronologically through the history of the site, from prehistory and Roman times to the present day. Along the way, he weaves in explanations of the uses of the palace over time as a way of explaining the architectural aspects of the site: why various buildings were placed where they were; what they were used for; and what you might see if you visited the palace at various moments in its history. As a former stonemason who has put twelve years into researching this site, Wright is able to comfortably and clearly explain the uses of each building that stood in the complex, as well as why they are significant to the palace as a whole. Wright also gives tantalizing glimpses into the pastimes and tastes of the royalty who visited Clipstone and stayed there. For example, fun information like how much wine John demanded, and what sort of hunting Edward II came to enjoy in Sherwood Forest. He also touches on the political importance of Clipstone as a meeting place and frequent stop on royal progresses, and he explores its role as a sort of getaway spot for the court to enjoy outdoor pursuits. Sherwood Forest is its own presence in the book, and Wright’s sections on medieval Forest Law are full of little nuggets of the type of trivia I find fascinating. A Palace for Our Kings is the type of book that would appeal to people who already have a love of history, as it is chock-full of details that will captivate readers who love to learn how things worked. Readers certainly don’t need to have prior knowledge of history to enjoy it, however, as Wright’s friendly explanations neatly take care of any background information necessary. The appendices at the back are a treasure trove for those interested in the minutiae of the palace’s history, and include everything from royal family trees to the salaries of Clipstone’s chaplains. Returning it to its former glory as a place of bustling activity and life, James Wright’s A Palace for Our Kings lovingly restores Clipstone to its rightful place in history as an iconic forest palace, a symbol of royal power, and a place for leisure. It’s an informative, rewarding read for anyone interested in the evolution of medieval palaces. James Wright is a Senior Archaeologist at the Museum of London Archaeology. Formerly he has worked as a conservation stonemason. His previous publications include a book on the Castles of Nottinghamshire and several journal articles relating to castles and palaces. Alongside fieldwork at Mediaeval buildings such as the Tower of London, Knole, the Palace of Westminster and Southwark Cathedral he has researched the history and archaeology of Kings Clipstone for over twelve years. Visit James’s Kings Clipstone social media on Facebook and Twitter for more information on his project work and read our blog article about his relationship to the site.